The first homes in Notting Hill Genesis’ regeneration of the Aylesbury Estate will be delivered by Hill. Hill will build 229 homes on a parcel of land known as “Package A” at the junction of Bradenham Close and Westmoreland Road, after being appointed on a £70m contract. Of those homes, 84 per cent will be available for social rent, including 54 extra care units and seven homes for people with learning difficulties. Package A is part of the wider First Development Site, which will provide more than 800 homes, a community facility and new public open space. 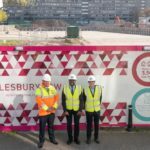 The regeneration of the Aylesbury neighbourhood is a long-term partnership between Notting Hill Genesis and Southwark Council. Over the lifetime of the project we will deliver more than 3,500 new homes, half of which will be affordable housing. Of that half, 75 per cent will be available for social rent.